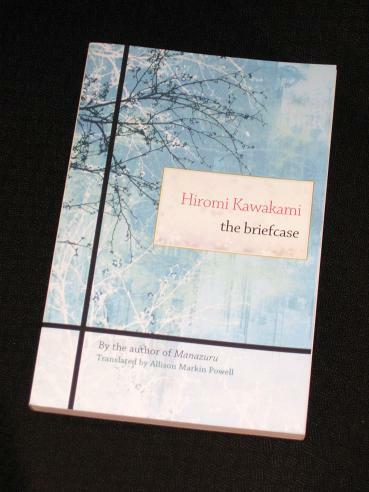 Hiromi Kawakami’s The Briefcase (translated by Allison Markin Powell) is a brief but powerful novel about the development of a rather unusual relationship. Set in present-day Tokyo (largely in a Japanese bar, or ‘izakaya’), it tells of a chance meeting between Tsukiko, a single woman closing in on forty, and her old Japanese teacher Harutsuna Matsumoto – the man she simply calls ‘Sensei’. What begins as occasional drunken conversations in the bar turns into a much closer friendship. The odd couple go for long walks, embark on shopping trips, have dinner together, and later even go mushroom hunting. The two enjoy their friendship, but with an age gap like theirs, surely there can’t be romance here – can there? The Briefcase is a bitter-sweet love story, a development of the rather unorthodox relationship between two people who stand out a little from the crowd. Sensei is retired and divorced, an old man, but one who is always dapper in his suit (and with his briefcase ever in hand). Beginning as a figure of fun, his character is sketched out a little more with each appearance, allowing the reader to get to know him just as Tsukiko does. In fact, while the reader initially struggles to accept the May-to-December nature of the relationship, later on it is Tsukiko’s (in)ability to surrender her independence which is of more interest. Can she even allow herself to enter into a real, mature relationship? The Briefcase is an enjoyable novel to read due to the episodic nature of the text. The story is divided into seventeen chapters of fairly equal length, taking us unhurriedly through the build-up of the relationship (in fact, it is very similar to The Old Capital in this regard…). There are three two-chapter sections (Mushroom Hunting, The Cherry Blossom Party, The Island) spaced out over the novel, each one a turning point in the relationship. It all makes for a very smooth read. Of course, the success of the novel hangs entirely on how believable Sensei and Tsukiko’s relationship is, and Kawakami handles this very well. Before starting, I thought it might be a little like Yoko Ogawa’s The Housekeeper and the Professor (a book I liked but didn’t find particularly special), but that wasn’t the case. The relationship progresses naturally, convincing us not only that it is possible, but also that it is natural, and the addition of a catalyst in the shape of Kojima, Tsukiko’s old classmate, helps to push the story along when it is in danger of drifting. You’ve read my thoughts on the book – why not see how others found it? This has had many wonderful reviews so I'm looking forward to reading it. I loved The Housekeeper and the Professor for it's depiction of maths as a part of life but also for its sweet sense of family. But now I'm curious about what you've said about Tsukiko's behavious. Sakura – Well, hopefully, there'll be many more reviews over the next day or so 😉 I enjoyed this a lot more than I expected to it, probably because it was ever-so-slightly off-kilter (and with lots of drinking…). I read it , too, with great pleasure, and I agree with you that it was totally believable. However, why the title? And more importantly, why is Sensei's briefcase empty at the end? I posed my idea at the end of my post. Very much looking forward to reading Strange Weather from Tokyo when it arrives, and very muched enjoyed The Briefcase, although I found Manazuru to be a little more explorative, so look forward to reading your post on it. I'm really inspired with your writing abilities and also with the format for your weblog. Is that this a paid topic or did you modify it your self? Anyway keep up the excellent high quality writing, it is uncommon to peer a nice blog like this one nowadays.. I read this too and loved the idea…wasn't sure the translator was up for the subtlety of the whole thing though, especially after seeing Kawakami interviewed at the International Festival of Authors recently. Neither she nor anyone else said they agreed directly, but there was a lot of praise for the Michael Emmerich's translation of Manazuru and absolutely none of Powell's translation of The Briefcase. That, and how lovely and charming and thoughtful she seemed in person, made me run the risk on buying Manuzura (which, of course, I haven't read yet). It's a book I'd love to read. A delicate relationship between two sensitive individuals. Enjoyed your review. …OK everyone, help me out here! Stu – I can see that (and it would have been interesting to read as a series – if I had the patience…). A possible Man Asian winner? Book Dilettante – Thanks 🙂 It's well worth a read (like many J-Lit works!). I'm very glad you liked her. She is one of my favourite Japanese authors, certianly more complex than Banana Yoshimoto but still, I would say a good starting point for people not too familiar with Japanese literature. What do you think? I liked Manazuru a little less. I've read a third one, after all, probably my favourite of the three but I have no clue whether that's the one that will come out. There is no need to look forward to reading Strange Weather from Tokyo, Tony, as you already have. That is the UK title of The Briefcase, which I found out to my expense today, cheers. Vambo – Yes, I found that out a while back; I think I should update the post to warn other people (I hope I didn't make you buy it…).